Who is Sharla P. Boehm? Last November I had the pleasure of attending the Museum Computing Network conference – which I highly recommend. It was at a session there that I watched Rosanna Flouty as she presented the diagram below in her slides, illustrating different models for organizing communication. 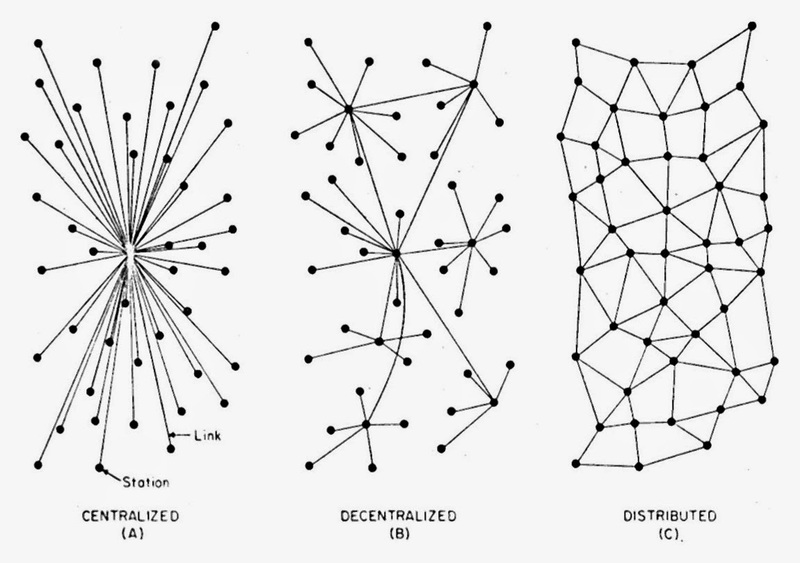 Some of you will recognize the source – it comes from the work of Paul Baran in the early 1960’s, when he was part of a small group of people thinking deeply about how to build networks of communication between computers. 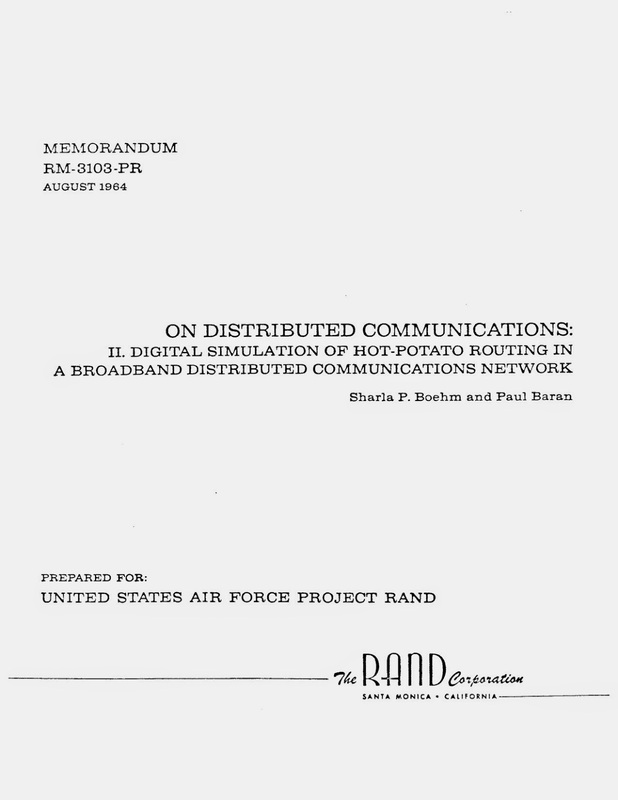 Baran’s work, completed at Rand Corporation in Santa Monica, was foundational in the creation of what would become the Arpanet and, eventually, the Internet. The core of Baran’s contribution was what we now know as packet switching – the idea that in order for computer A to send a message to computer B, you don’t need a fixed electronic “pipe” between them. Instead, you can break the message up into small pieces, called packets, and pass them from one computer to another, heading in the direction from A to B. This strategy has tremendous advantages – for example, messages can be rerouted in the event one computer fails or becomes overloaded – but this wasn’t apparent at the time. In fact, many people questioned whether or not Baran’s idea could work at all. This was part of the 11-part series that established the effectiveness of packet switching, or, in the more colorful terminology used here, “hot-potato routing”. As I mentioned, there was far from universal acceptance of Baran’s proposal, and this paper was important because it contained a detailed description of a simulation, written in the programming language Fortran, that demonstrated not only that packet switching could work, but exactly how it could work. And look at the authors of the paper: Sharla P. Boehm and Paul Baran. Who the heck was Sharla P. Boehm? Paul Baran is generally considered one of the four or five most important “Fathers of the Internet”, but who is Sharla Boehm? I can’t remember ever seeing the name before, and I was determined to try to do some research to find out. Her name is the first on this paper, so obviously she made an important contribution, but one that seems to have been largely forgotten. Coincidentally, my wife Sharla had developed the original packet-switched network simulation with Paul Baran [Baran-Boehm, 1964]). So there it is – Sharla Boehm wrote the code that demonstrated the feasibility of packed-switched networks. You can look up the original paper that she and Baran wrote, and read every line of code that she wrote and see the actual output from her program. So I salute Sharla Boehm and thank her for her contribution. She helped create the online world we live in today, and it’s wrong to overlook or forget what she accomplished. Once I had found the connection between Barry and Sharla Boehm I searched to see what else I could find. It appears that they are both alive and well and living in Santa Monica, not far from Rand Corporation where they apparently met. 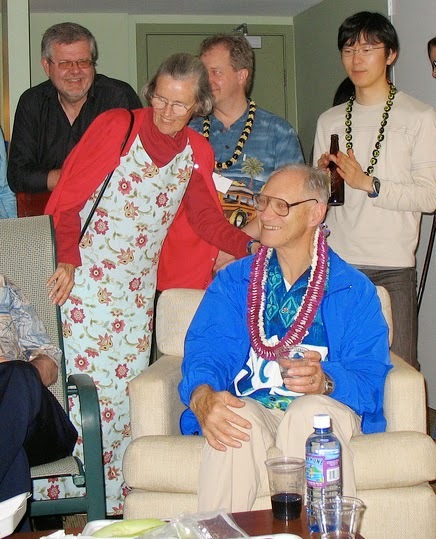 I did find one more thing – I searched Flickr to see if I could find a picture of Sharla, and found the photo below from a retirement party for Barry Boehm. There’s Sharla & Barry in front. I am glad to have a chance to “put a face” to the name on some 50 year old code that helped to change the world.